North Korea vows to work toward “complete denuclearization"
At the conclusion of their historic summit in Singapore Tuesday, President Trump and Kim Jong-un signed a document declaring the North Korean regime will work toward the “complete denuclearization of the Korean peninsula” and commit to a “lasting and stable peace.” In return, Trump vowed to provide unspecified “security guarantees” to North Korea. 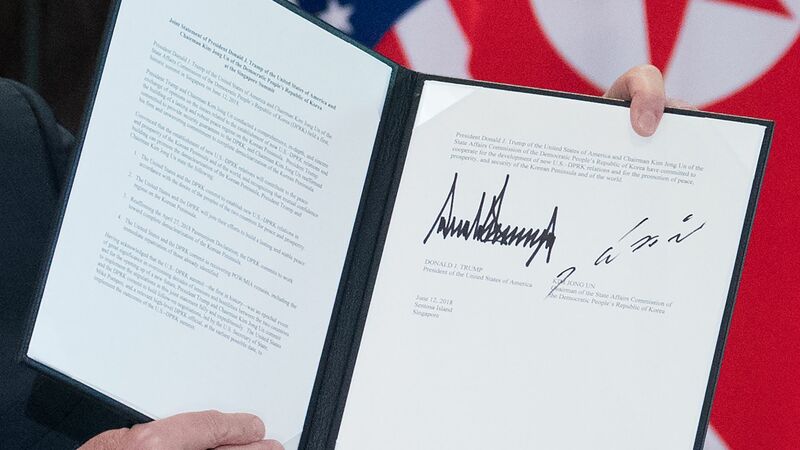 Why it matters: The agreement, while a large step forward in what will likely be a lengthy process to normalize relations between the two countries, provides no details about how the U.S. and North Korea plan to achieve these goals. It also fails to define "complete denuclearization."